#6: Joining Kundalini with the crown chakra: After the upward journey of Kundalini, coursing through the Sushumna channel and the chakras along the way (section #5), it is finally brought to the crown chakra, Sahasrara. This union is the Realization of the Absolute, and is the meaning of Yoga. It usually comes in bursts: There are stories of some person suddenly having an instant awakening and complete transformation, reaching the absolute height of spiritual realization, and having all of their latent impressions (samskaras) that drive karma removed. While this might be theoretically possible for anyone, it is much more common that the awakening and realization of union comes in small parts, much like sparks compared to a lightning bolt. Such bursts can be extremely insightful, peaceful, and motivating. In such moments there may come a flash of insight about some aspect of reality, philosophy, or divinity. Previous issues or questions might become resolved in a moment. In any case, such experiences inspire one to gently continue on the path. Fear may come: Experiences, even those flash-like glimpses, might come as a complete surprise, in moments when least expected. Often such experiences show us, in one way or another, that the reality of the world and ourselves is not the way it appears in the external way. While the experience may be very peaceful and inspiring, it is also common for there to be a wave of fear. It is a natural part of the process, and is a reaction to the fear of death. It is not that death is immanently coming to the physical person, though some old ideas or impressions might be releasing. Preparation is imperative: To repeat from earlier, it is easy to read the descriptions in the books about Kundalini Awakening and the union of Shiva and Shakti, and to want to have this immediately. This seems to be a natural desire, that is useful if properly channeled into the motivation to do the practices. However, it is imperative that one be prepared for the energy that may be released in such an experience. If one is not ready, it can be like putting too much electricity through a small wire or fuse, and that is not useful in the long rung. It is far better to be prepared, to make the body a healthy vehicle, the breath a balanced channel of energy, and the mind an intellectually and emotionally stable conduit for the experience. This involves diet, exercise, and cleansing practices, including systematic introspection and the various breathing practices. Balanced Ida and Pingala is a key: As was already mentioned in section #2 and section #3, balancing Ida and Pingala, and having Prana flow in Sushumna are extremely important preparations, that also bring their own benefits of inner peace. The value of gaining mastery in the breathing practices that support this centralized flow of Prana cannot be overemphasized. There is no longer an unconscious: Once the Kundalini Shakti attains the state of union with the pure consciousness at the sahasrara, there is no longer any unconscious during that time. There is no longer a latent aspect, as full illumination has come, eliminating this polarization of active and latent. Awareness of the body and the external world is withdrawn into the highest samadhi. Body is in mind; mind is not in body: One comes to see in experience the truth that all of the body is in the mind, but that not all of the mind is in the body, as it usually seems. To the external view of other people, the body of one in this heightened state of union may appear to be dead. It may be cold to the touch, and there may be no perceptible vital signs, such as a pulse. The body continues to function so that it might be used again after the individuality returns. Involution and evolution: The process towards realizing and abiding in pure consciousness is one of evolution. The involution of consciousness into the human being is conceptualized as being a process of the creative energy of Shakti condensing further and further into solid form, and falling asleep at the first chakra, at the perineum near the base of the spine. The process of Kundalini Awakening reverses this involution until the full potential of the human is realized in the return to the pure consciousness. Pushing or pulling the Kundalini: With the goal being the merging of Shiva and Shakti, the latent with the creative, there are two general approaches. Most of the work with Kundalini Awakening, both the preparation and the awakening itself, are done from the lower chakras. The process is one of awakening and pushing the energy upwards in one way or another. A more direct approach for those who are prepared is to pull the energy upward by working directly with the chakras between ajna chakra (eyebrow center), and the subtler chakras between there and the sahasrara (the crown chakra). Between ajna and sahasrara: From the ajna chakra at the eyebrow center, the journey is up the brahma nadi, an extension of the Sushumna channel. This may be first experienced in the dark field of mind as a black object, lingam, circle, or tunnel entrance. Along the journey to the sahasrara chakra at the crown of the head (also known as the thousand-petalled lotus or brahmarandra), there are other chakras, bindus (points), and levels of consciousness that are encountered and transcended. To go through these levels (called piercing the bindu) can seem like explosions or crashing through walls. If awareness does not stop at one of these points along the way, it comes to the union of the individual and the Absolute. Beyond the chakras: While the chakras are studied and explored in the earlier stages, there comes a point where the student comes to know the science beyond the chakras. This learning is given in complete stillness and silence, subtler than all of the sounds and forms related to the chakras. This knowledge is not available in any book or school, and can happen wherever the aspirant is physically located, whether close or far from any geographical location in the world or physical teacher. Some schools of meditation say that the student should study the chakras in depth. Others say that this is a waste of one's life, and that it is better to know the chakras only well enough that you recognize them when their features flash in awareness, devoting your energies to the teachings and realities beyond, seeking the greater knowledge called mahavidya. Guru chakra: Beyond the first six chakras, between there and the crown chakra, many other chakras, levels, or layers of reality are experienced. For the aspirant who is willing to do so, the guru chakra is used to purify the mind and to bring down spiritual truths. "Gu" means darkness and "ru" means light. Guru is the light that dispels the darkness of ignorance. Guru is not any person, although guru may operate through a person. Guru is actually the higher knowledge itself. Guru chakra is the doorway to that knowledge, to the wisdom and guidance of the teacher within. The sixth chakra, at the eyebrow center, is called ajna chakra, which includes "a" and "jna", which means the center without knowledge or with little knowledge ("a" is without and "jna" is knowledge). Guru chakra is experienced in the forehead, and is also called jnana chakra, or the center with knowledge. The knowledge of ajna is lower knowledge, while the knowledge of jnana is higher knowledge. The yogi invites all of the thoughts and samskaras to arise in the mind field of ajna chakra and offers them into the higher knowledge, the triangular shaped fire of guru or jnana chakra (Ajna and guru chakras are also called drikuti and trikuti respectively). From that process the pathway is cleared, and higher wisdom and teachings come down to the ajna. Eventually, awareness itself travels upward, receding through and beyond, to That which is the final abode, the Absolute, the union of Shiva and Shakti. Tripura: Tri means three, and pura means city. Tripura is the consciousness that operates in the three cities of Waking, Dreaming, and Deep Sleep, as well as the Conscious, Unconscious, and Subconscious aspects of mind. Sometimes conceptualized as the divine feminine (Shakti), compared to the divine masculine (Shiva), she permeates the three cities of the Gross world, the Subtle plane, and the Causal reality. Tripura also permeates the many other trinities such as the beingness inherent in past, present and future. This is a Tantric rendering of the three levels of consciousness mapped out by the OM Mantra symbol, and its levels of Vaishvanara, Taijasa, and Prajna. Dedication, devotion, love, and surrender into this creative source or divine Mother is one of the finest aspects of Tantra as a direct route to Realization. Some conceptualize Tripura as an anthropomorphic deity, while the subtler practices are directed towards Tripura as formless, that fourth state beyond the other three cities. 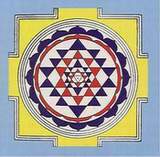 The Bindu of Sri Yantra is the symbol of this highest transcendent Reality. 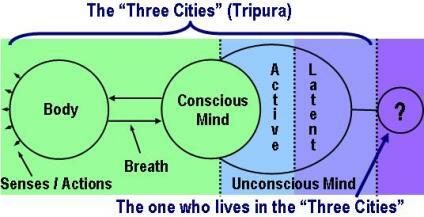 The quality of the three cities is an aspect of OM Mantra, Gayatri Mantra, and Mahamrityunjaya Mantra. Shaktipata: When all of the other practices have been done, and the final barrier is encountered, that may be removed by the force or grace of Shaktipata, which means the bestowing of Shakti. It is given through the gift of consciousness called grace (kripa) or guru, whereby a transference of energy happens, somewhat like a magnet affects some metal objects. The experience of Shaktipat is consciously experienced in an intense way. It may come in a single, large burst, though more often it comes in smaller experiences along the way, with each adding insight, as well as impetus and inspiration for further treading of the path. It may come through the physical vehicle of a person or by transmission at a separate time and place, independent of the presence of any person. Sat chit ananda: The realization of the true Self is best described as indescribable. However, for convenience sake it is sometimes described as being the nature of sat, chit, and ananda. Sat means existence itself. Chit means consciousness. Ananda means bliss. Cosmic consciousness: Richard Bucke describes the direct experience of the whole of consciousness in his 1901 book, Cosmic Consciousness. It is a description of attaining subtle realm experience, and the "conception" of the whole of the universe. This is coming close to the realization of the union itself with the whole, though still somewhat short of that realization. "Like a flash there is presented to his consciousness a clear conception (a vision) in outline of the meaning and drift of the universe. He does not come to believe merely; but he sees and knows that the cosmos, which to the Self Conscious mind seems made up of dead matter, is in fact far otherwise - is in very truth a living presence. He sees that instead of men being, as it were, patches of life scattered through an infinite sea of nonliving substance, they are in reality specks of relative death in an infinite ocean of life. He sees that the life which is within man is eternal; that the soul of man is as immortal as God is; that the universe is so built and ordered that without any pre-adventure all things work together for the good of each and all; that the foundation principle for the world is what we call love, and that the happiness of every individual is in the long run absolutely certain. The person who passes through this experience will learn in a few minutes, or even moments, of its continuance more than in months and years of study, and he will learn much that no study ever taught or can teach. Especially does he obtain such a conception of the whole, or least of an immense whole, as dwarfs all conception, imagination, or speculation, springing from or belonging to ordinary Self Consciousness, such a conception as makes the old attempts to mentally grasp the universe and its meaning petty and even ridiculous." "The ego has disappeared. I have realized my identity with Brahman [the word for the absolute reality] and so all my desires have melted away. I have risen above my ignorance and my knowledge of this seeming universe. What is this joy that I feel? Who shall measure it? I know nothing but joy, limitless, unbounded! "The ocean of Brahman is full of nectar--the joy of the Atman [the individual Self]. The treasure I have found there cannot be described in words. The mind cannot conceive of it. My mind fell like a hailstone into that vast expanse of Brahman's ocean. Touching one drop of it, I melted away and became one with Brahman. And now, though I return to human consciousness, I abide in the joy of the Atman. "Where is this universe? Who took it away? Has it merged into something else? A while ago, I beheld it--now it exists no longer. This is wonderful indeed! "Here is the ocean of Brahman, full of endless joy. How can I accept or reject anything? Is there anything apart or distinct from Brahman? "Now, finally and clearly, I know that I am the Atman, whose nature is eternal joy. I see nothing, I hear nothing, I know nothing that is separate from me."